If you are on Gary’s email list, you know that learning to live with diabetes is not easy. We have all learned that just about everything makes diabetes care a little harder; activity, food, mood, attitude and more. It is an unwelcome addition to the list, but I’ve got one more – policy. Policy interacts with diabetes in many ways, at many levels. There are more than three dozen federal agencies that touch diabetes care, safety, access, and quality. State policy impacts schools, diabetes education, and even protocols to protect glucose testing from spreading infection in care facilities. Better policy happens when officials hear the real needs of constituents. But for many people who care about diabetes, learning the intricacies of advocacy is just one thing too many. That is totally fair. Somebody Needs to Make Diabetes Advocacy Shortcuts. Fortunately, the Diabetes Patient Advocacy Coalition (DPAC) can help. People who live with diabetes founded the Coalition with the goal of making policy actions easy. DPAC helps more voices speak on gaps in the diabetes policy landscape. The Diabetes Patient Advocacy Coalition works with the policy teams at the American Association of Diabetes Educators (AADE), American Association of Clinical Endocrinologist (AACE), and others. We write about advocacy with Integrated Diabetes, MyGlu, Facebook, Twitter, a Blog and more. 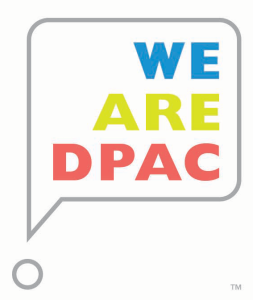 In all of those places DPAC provides simple ways to connect people who care about diabetes with their policy makers. For example: On February 20th, DPAC joined with an expert group, that included Gary Scheiner, in a Consensus Conference brought together by AACE. We were all there to find agreement on Continuous Glucose Monitoring. There is a bill in Congress on CGM access. DPAC can help people who care about CGM share urgency with Congress on that bill. DPAC tracks which members of Congress sponsor CGM Access, and, with the click of a mouse a “Thanks” is sent to bill supporters and asks those who have yet to sponsor the bill to come on board. Some people want to dig into the details of issues. To help, DPAC has started a monthly “Ask An Expert” webinar series. It is just what it sounds like, experts talk in detail about an issue that touches people with diabetes and takes questions. Then DPAC shows how to ACT NOW for better policy. The experts include individuals from what looks like a bowl of Alphabits cereal; CDC, NMFQ and AACE’s Consensus Conference process mentioned above. 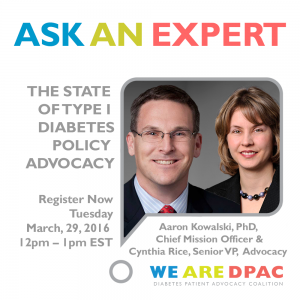 In March JDRF’s Aaron Kowalski and Cynthia Rice will talk about the State of Type 1 Diabetes Advocacy. You said easy. All of the above sounds complex!